The American Groundhog - part of an American weather forecasting tradition for decades. This morning, Punxsatawney Phil emerged from his den and saw his shadow, indicating 6 more weeks of winter are in store.Â The nation’s most famous groundhog emerged just after dawn in front of about 13,000 witnesses, many dressed in black-and-gold to celebrate the Pittsburgh Steelers’ Super Bowl victory the night before. As legend tells it, if the groundhog emerges from its burrow and fails to see its shadow because the sky is cloudy, winter will soon come to an end. Alternatively, if it is sunny and the groundhog sees its shadow, the groundhog will supposedly retreat into its burrow, and winter will continue for six more weeks. 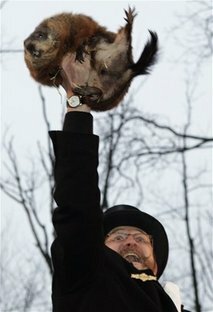 The annual ritual takes place on Gobbler’s Knob, a tiny hill in Punxsutawney, a borough of about 6,100 residents some 65 miles northeast of Pittsburgh. Groundhog Day has been celebrated since 1887. According to tradition, if a groundhog sees its shadow upon emerging from its burrow that day, there will be six more weeks of winter.Â If not, spring is on its way. 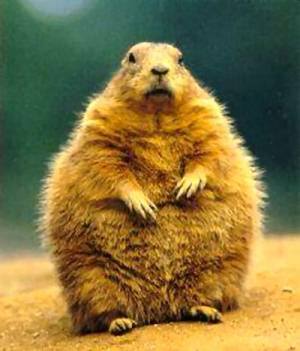 The groundhog, or woodchuck, is one of 14 species of marmots. They are common in the northeastern and central United States. Weighing 4 pounds to 14 pounds and reaching about 2 feet in length, groundhogs can move about 700 pounds of dirt when digging a burrow for winter hibernation. The largest Groundhog Day celebration is in Punxsutawney, Pa., which draws crowds of up to 40,000 people to Gobblerâ€™s Knob every Feb. 2 to watch Punxsutawney Phil do his thing. City residents claim the groundhog has never been wrong, although few empirical studies have supported the claim. About 90 percent of the time, Phil sees his shadow. 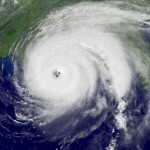 For more information on Groundhog Day or to view Philâ€™s prediction, go to www.groundhog.org.